Yes – and we raise 50% of all ration ingredients directly on farm. How do you pasture birds in the winter? We use large open hoop buildings with deep bedded straw. This gives them a great natural environment to scratch and dust bathe while allowing our dormant pastures to rest through the winter months. Once the grass greens up in the spring, they are moved out of the hoops and back to their salad bar. 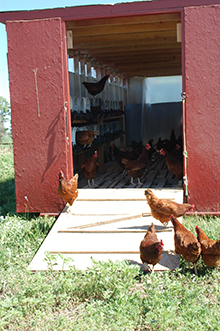 Do you resell other farms’ eggs? We only sell what we produce. We know how important trust and integrity are in a food system that lacks both so we never have and never will sell eggs produced by any other farm but our own. Why aren’t you Certified Organic? We recognize the value of having a third party verify what we are doing, but the process is very expensive for a farm with multiple species. We have an open door policy and anyone is welcome to come and verify for themselves the care and attention we place on our animals welfare. What happens to your hens when they are done laying? Unlike most large farms, we don’t just kill our birds and get new ones. We sell them as stewing hens or as backyard birds for people who want a hen that is already laying. Do your eggs really taste better? If the customer is always right, then they have proven this time and time again. The single most heard compliment is “I can’t believe an egg can taste so rich and flavorful”. Are you going to offer a soy-free egg? We are busy sourcing local ingredients to make a soy-free ration. We feel it is our responsibility to use the resources closest to us and many of the ingredients used in soy-free rations are not grown in Colorado fields. We’ll keep you informed of our progress.